Here’s a simple experiment: observe a group of preschool children in an indoor classroom sitting for 30 minutes, paying special attention to any conflicts that arise, how willing they are to connect with each other, and how confident they seem about trying new things. Wily teaches preschool at the Squaxin Island Tribe’s Child Care Development Center (CDC) as part of a new outdoor education program for preschoolers. 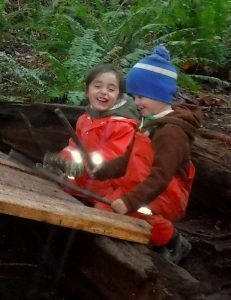 Students and their teachers spend four hours a day exploring the center’s abundant forest, which includes two creeks. Since the program opened on October 1, 2018, students have learned firsthand about salmon by observing the annual chum run, built shelters, and harvested clay from the creek for projects, among other things. “They were able to go down and actually touch the salmon this year and see the difference between males and females,” says Operations Manager Sabrina Green. “They learned about the different types of salmon and saw them spawning. We talked about the circle of life and what happens to the fish.” During that time, tribal biologists responsible for monitoring the creek and the salmon runs visited the school and interacted with the children. The Center had always incorporated nature into its curriculum, but in 2016 they were approached by their state licenser from the Department of Children, Youth and Family. “She said, ‘We have this pilot program for preschool, and I think it’s right up your alley,’” Green explains. The CDC began as an observer school, but when other groups dropped out of the pilot program, the school moved into the implementation phase. “Luckily, we get to partner with people who’ve always had outdoor preschool programs,” says Green. “They just haven’t been licensed because that wasn’t an option in our state until now. 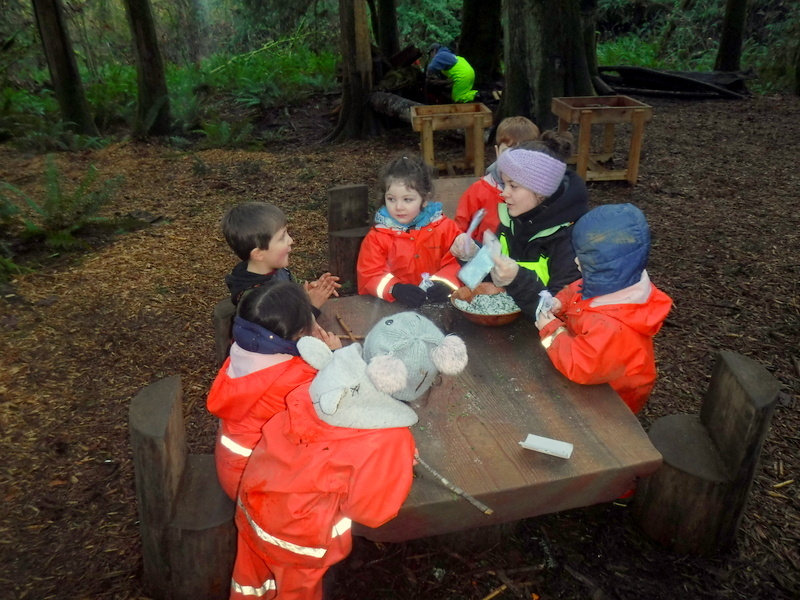 We’ve asked them a lot of questions.” In summer 2018, Green and five colleagues attended an Early Learning Institute at Islandwood on Bainbridge Island to further their training. The program is a hit with students and parents, Green notes. Parents share that their children come home at night, eat all their dinner, go to bed and sleep all night, whereas before, meals and bedtime were a daily hassle. “People tell us, ‘I ask them what they did today and instead of getting, ‘I played,’ I actually get a story about something that they did because the kids are so excited to share,’” she says. 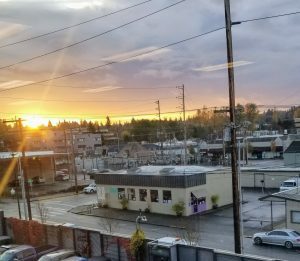 Multiple studies have found that time spent in nature has cognitive, social, and physical benefits for all ages, including increased creativity, greater focus, less anxiety, and a greater sense of wellbeing. Author Richard Louv summarized much of the existing research in his 2005 bestseller Last Child in the Woods, and the evidence has only grown since then. As a school run by the Squaxin Island Tribe, the CDC gives tribal families the first opportunity to enroll. Aside from the 24 children in the Outdoor Program, the center includes two infant rooms, three toddler rooms, and three other preschool classrooms for three-year-olds, four-year-olds, and five-year-olds. Since last February they’ve been in partnership with Educational Service District (ESD) 113. The two classrooms for older children include placements for students in the Early Childhood Education and Assistance Program (ECEAP) and Headstart and the Outdoor Program also includes five slots for ECEAP students. 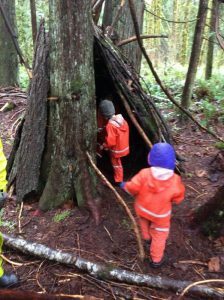 Learn more about the Squaxin Island Tribe’s Child Development Center at their website or by calling 360-426-1390.